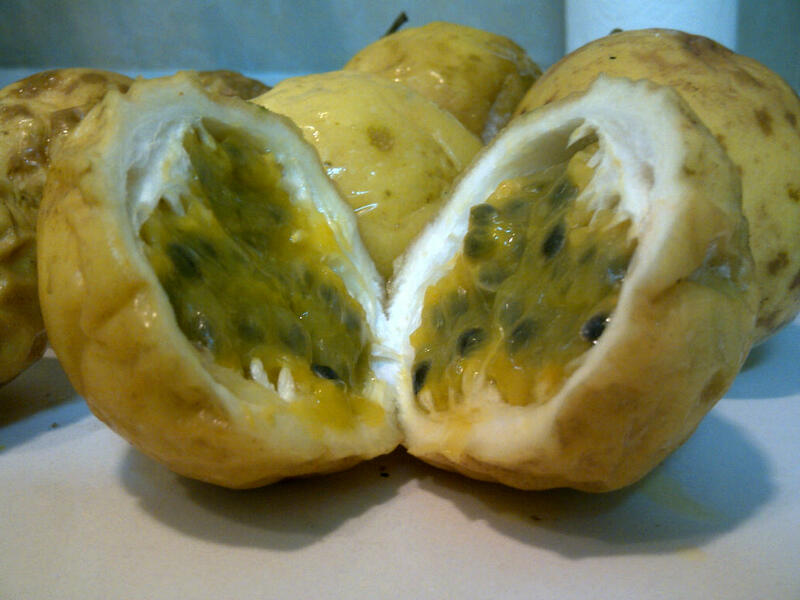 Granadillas (Passion Fruit): Wrinkly and yellowish on the outside. Gooey, sweet and tangy eye-things on the inside. I remember it being really rare, while growing up in Florida, to come across litchis, guavas or any other “exotic” fruits in the local grocery stores that my parents would remember from their childhoods in India–outside of maybe the occasional crate of mangoes during the summer time. But as we had a mango tree in our own backyard, I did not consider this to be very “exotic”; and always felt that our grocery stores were missing something. Life has a funny way of being ironic. For some reason, people don’t like to shop with me. Supermarkets in Maputo, the capital city, are much like those I grew up with in the US, (except decidedly less organized); and the open air markets here most closely resemble flea markets back home. But when you begin to drive to the outer skirts of town along the coastline and start to approach the farming villages–the markets on the side of the road begin to take on a distinctly rural, African vibe. Women and young children, some dressed in traditional capulanas–swarm you, the moment you get out of the car–to get you to buy their cashews, or fresh honey, or a gigantic pile of seasonal fruits and vegetables. Ladies who, a moment ago, were enjoying the shade of nearby trees rush to get up in the scorching Mozambique sun, as you express even the slightest interest in their baskets of assorted piri-piri peppers, or neat rows of sugar-apples (“Seethaphal” in India) lined up on a thin sheet on the dirt road–some dark shades of green, others spotted and crusty. They break off chunks of the sweet potato roots–which look as though they have just been plucked out of the earth, caked as they are with dirt–with their teeth, to show you their quality. I’ve had to ask the locals, many times, while pointing to a particular product I’ve never seen “Que é isso?” to be answered with free samples of fruits and vegetables; some varieties of which I doubt exist outside of this little bubble of society–as they form on little vines, or taste too leathery, but have just a tiny little bit of sweetness at the end–(not likely marketable to a wide audience, perhaps; but as fascinating as they are untouched by the ever-present branches of the industrial revolution). It’s at the same time humbling—a glaring example of disparity in global wealth distribution—as it is remarkable: an organic farmer’s dream come true. And it was with this bustling image in my mind that I went back home to the US this last holiday, and experienced a bit of reverse-culture-shock while admiring the pristine, gleaming rows of identically shelved boxes in every aisle of the Publix grocery store–and gawked in surprise at the polite, efficient and non-invasive customer service. But after an especially sharp whisper from her telling me to “get a grip” when I burst into applause at the Publix bakery aisle and tearfully hugged a box of chocolate chip cookies while singing an impromptu rendition of “America the Beautiful” — I had to stop abruptly, not at her reprimand, but at the sight of the produce section. A meticulously arranged pyramid of circular apples–blindingly bright red, each the same size, each the same shape. Rows of gigantic bananas stacked on one another aesthetically–blindingly bright yellow, each the same size, each the same shape. A neat bunch of symmetrical, cylindrical clean carrots–blindingly bright orange, each the same size, each the same shape. My left eye started to twitch. Standing there, for several moments, gaping uselessly—I next remember being dragged out of the store slowly; still clinging, of course, to the box of cookies, but now suddenly unable to produce speech– pointing in blank shock–while my sister tugged at my arm, muttering things (in what I would like to think was a tone of irritated affection) that sounded like ‘gimme the cookies so we can pay, weirdo’. But I didn’t hear her. Everywhere; all around us–there had been a group of fruits that were all exactly the same in color, all exactly the same in shape–and when we went home to try them, all exactly the same in taste. My parents examined the grapes curiously. “Oh yeah…” they said, peering at them more closely. Her eyes narrowed spitefully, as though I had said something unpatriotic. After all, over the course of the last three years, my sister had been used to having the upper hand. “Oh, we can’t load the video you sent,” I would say over the phone, “–because we’re almost out of gigs this month. GIGS–as in, GIGABYTES.” or “No, we can’t watch TV and have the internet on at the same time; but now I want to watch this TV show, so I have to unplug the coffee pot.” or, “The Mindy Project? No, what documentary was that?” and so on. So when the time came for frustration, it was normally the other way around. But here I finally had my chance. 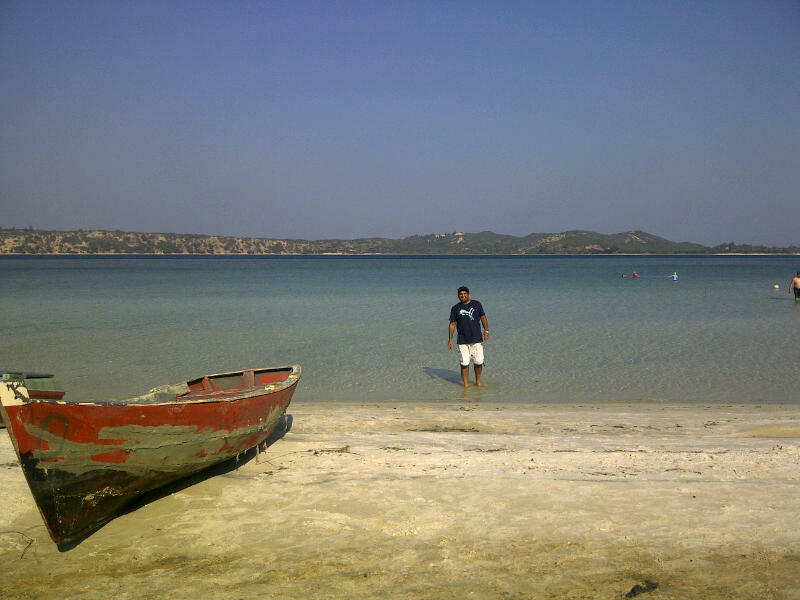 Here is where Mozambique wins. “Because you see,” I began, in the kind, loving voice in which I give my sister life lessons–(which I say sounds slightly like Morgan Freeman; and she says sounds slightly like “Miss Piggy”)– “…the world was meant to be filled with variety.” I gestured towards the kitchen to indicate “the world”. My parents nodded, politely. My sister looked as though time had started to move very slowly. “In the natural world, species that vary; prosper. They are more resistant to diseases, more resistant to change, and therefore, better equipped for survival…” I noticed, out of the corner of my eye, as my parents’ expressions glazed over, my sister began to stuff larger handfuls of grapes into her mouth like a panicked chipmunk; sensing a threat. I swatted the bag of grapes away from her. She scowled. My sister lunged for the bag again—and this time was successful–managing to somehow tackle me to the ground and stuff her mouth with another twenty gigantic grapes—all the while releasing a manic, wild laugh of victory. I know I made a difference that day. And so, last weekend, after carrying back bundles upon bundles of various fresh fruits from the farming village market, including an extra giant bag of granadillas–this conversation came to mind as I looked down to proudly see it contained a wide array of browns and yellows, often sweet and orange on the inside, but occasionally pale yellow and satisfyingly sour. 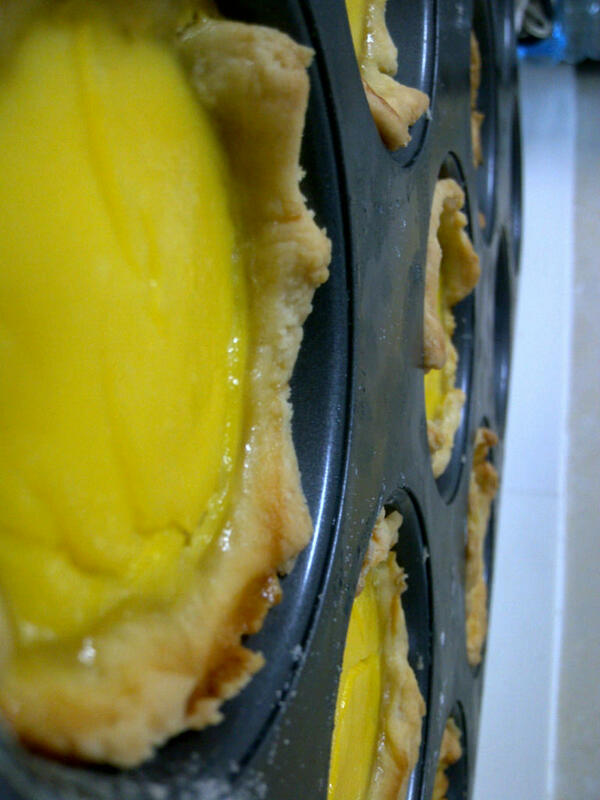 And as I admired their diversity, content in their bumps and flaws and differences; I knew the best thing to do would be to turn them into identical little yellow tarts. 1/2 cup Unsalted butter, cold. Mix salt and sugar to flour in a large bowl. Measure out cold butter, and chop it into cubes in the flour mixture (I used two butter knives). Then mix with fork to get tiny pieces. If you feel butter is melting, just stick the bowl in the fridge for a while. Add cold water by the tablespoon and mix with fork. 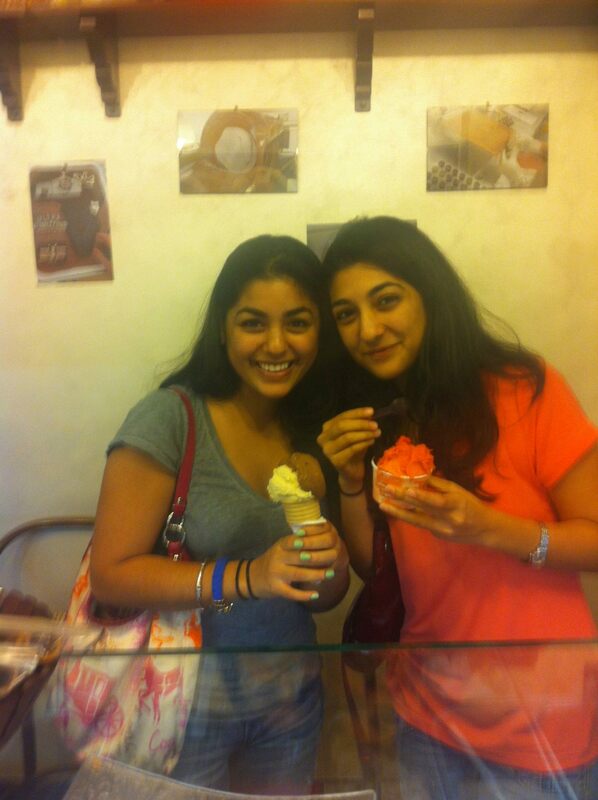 Dough will be crumbly, but will start to stick together. Roll into a ball, cover in cling wrap and stick in fridge for an hour. Put the pulp of about 10-12 granadillas into a bowl, and strain out the liquid. (This part is a little time consuming, but worth it.) Save the seedy pulp. Beat 4 eggs in a bowl. Add granadilla juice, milk, and sugar. Mix well. You might have to strain it once to make sure the sugar is dissolved. Stick bowl in fridge. Preheat oven to 175C (350F). Roll out the pie dough over a floured surface, and cut into rectangles. Place in a buttered muffin pan, adjusting the uneven sides. Stick muffin pan in fridge until oven heats up. Place dough in oven for about 10 minutes. 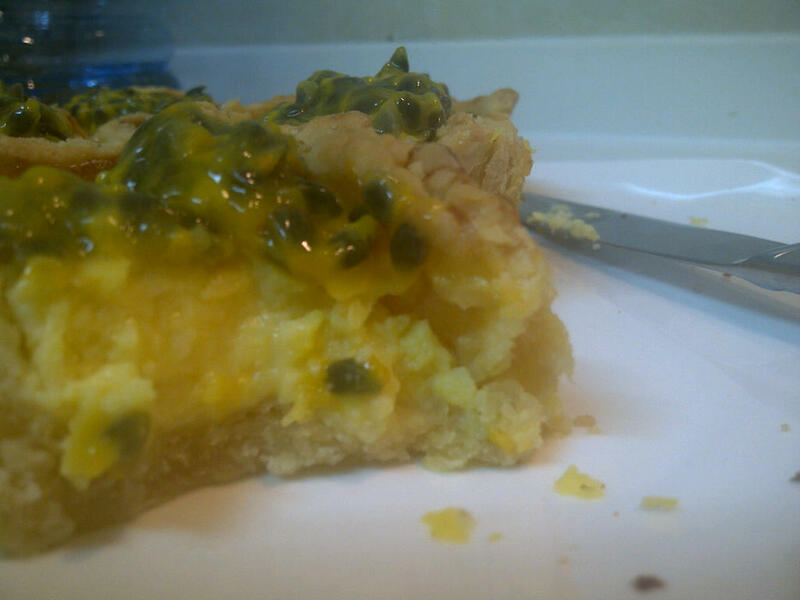 Take out and spoon the granadilla mixture into each tart. Place back in oven for about 15 minutes. When done, add pulp on top for decoration, and to add a bit more sour-sweet tartness. 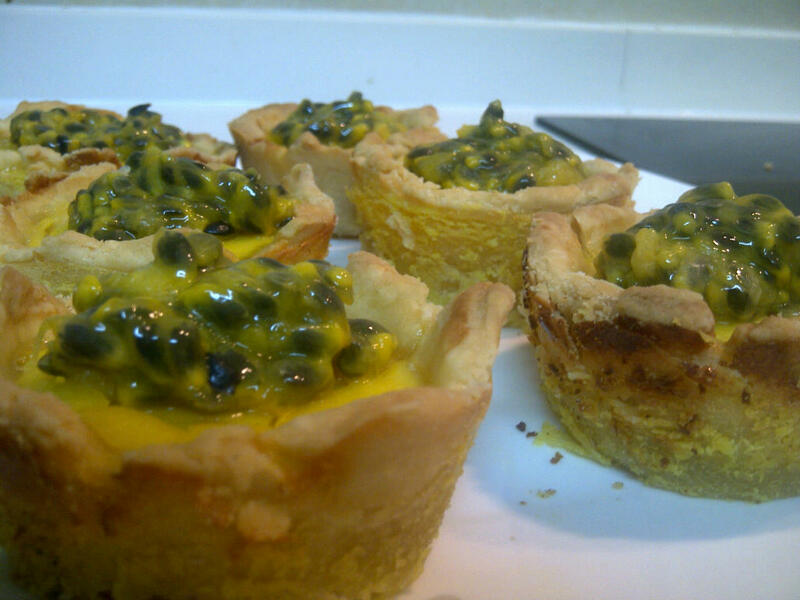 These tasted kind of like lemon tarts, but with a definite granadilla body. Next time, I would probably cook the custard before adding it in the oven, because the four eggs were a little overwhelming. I’d also thin out the dough to 1/8th of an inch rather than 1/4th. Adding the pulp on top brought out the granadilla flavor more. It is a little bit time consuming, with all the straining and draining–but you can always just use store-bought pulp or liquid. Granadillas can last at room temperature for maybe a week, but in the fridge they last for a pretty long time. 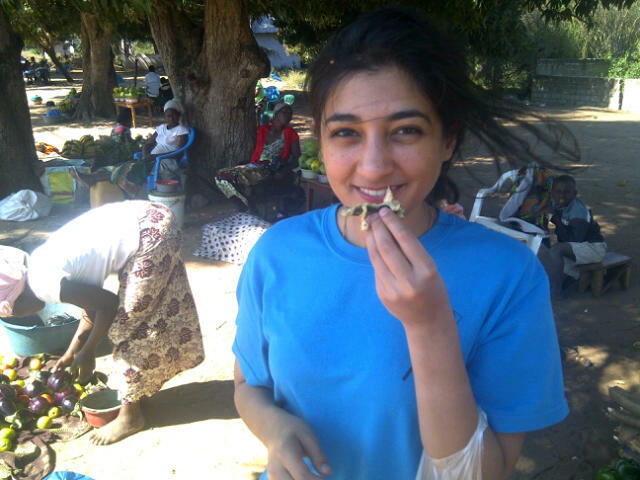 Admittedly though, they taste best when in their purest form, just smashed open with your bare hands; revealing the gooey, sweet and sour seeds inside–freshly picked from a town that I would have once called ‘exotic’ –in a little farming village 30 kilometers away from Bilene Beach, in Mozambique.